In this construction video tutorial, the eminent engineer S.L. Khan briefly explains the differences among rigid and flexible pavements. 1) The topping of rigid pavements are built up with PCC (comprising cement, aggregates, water and sometimes admixture). The dual bars are used for joints. Rigid pavements are not always made of PCC but they can also be made of RCC. Here cement is applied as binder. 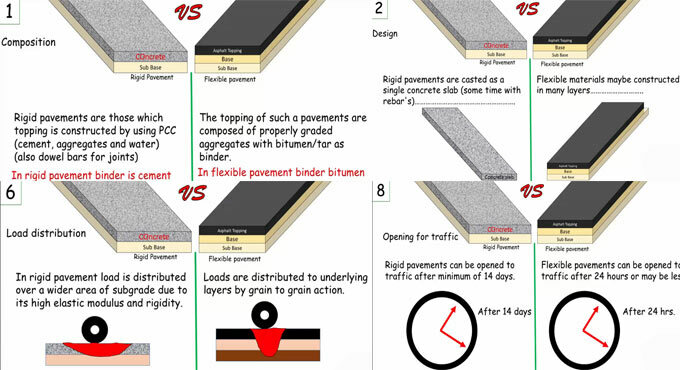 The topping of flexible pavements are made of perfectly graded aggregates with bitumen/tar as binder. The rigid pavements are casted as a single concrete slab (often rebars are also added). Whereas, flexible materials are built up with different layers like sub-base, base, under layers, topping etc. Preliminary cost is high and maintenance & repair cost is low for rigid pavement. Whereas, the preliminary cost is minor and maintenance cost is high for rigid pavement. Strength of rigid pavement is based on the flexural & compressive strength of placed concrete. Whereas, the strength of flexible pavement is based on interlocking of aggregates, cohesion and friction. In rigid pavement, induced thermal stress leads to wrap. Whereas, there is no thermal stress in flexible pavement because of the difference in temperature. In rigid pavement, the load is dispersed over a extended area of subgrade because of its extreme modulus and hardness. Whereas, in flexible pavement, the loads are dispersed to bottom layers with grain to grant action. Whereas, no joint is required in flexible pavements since they are placed continually. Rigid pavements are opened to traffic after minimum of 14 days of curing. Whereas, flexible pavements are opened to traffic after 24 hours or less time of curing.